We’d love your help. Let us know what’s wrong with this preview of Frozen in Time by Mitchell Zuckoff. On November 5, 1942, a US cargo plane slammed into the Greenland Ice Cap. Four days later, the B-17 assigned to the search-and-rescue mission became lost in a blinding storm and also crashed. Miraculously, all nine men on board survived, and the US military launched a daring rescue operation. 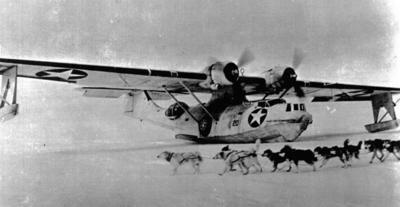 But after picking up one man, the Grumman Duck amphibious plane flew into a sever On November 5, 1942, a US cargo plane slammed into the Greenland Ice Cap. Four days later, the B-17 assigned to the search-and-rescue mission became lost in a blinding storm and also crashed. Miraculously, all nine men on board survived, and the US military launched a daring rescue operation. But after picking up one man, the Grumman Duck amphibious plane flew into a severe storm and vanished. To ask other readers questions about Frozen in Time, please sign up. Have the bodies in the duck ever been recovered? Sheri S. I see that this question was posted three years ago, and here's the latest information about it...I don't think the bodies have yet been recovered. …moreI see that this question was posted three years ago, and here's the latest information about it...I don't think the bodies have yet been recovered. Mitchell Zuckoff seems to be making a habit of looking into the travails of crash victims. His prior book, Lost in Shangri-la , followed three survivors of a WW II era plane crash in New Guinea. They faced the usual sorts of dangers, a step back to the Paleolithic, and a diverse assortment of possible ways to die; cannibals, elements of an enemy army, all sorts of predatory and/or poisonous critters, microscopic invaders that could ruin your day, and help see that it is your las Winter is coming. Or, ironically, the exact opposite of a milk run. It did not end well, and nine more servicemen were unwillingly grounded. Thanks to Coach Gordon Bombay and the Mighty Ducks (D2 to be specific), I already knew that "Greenland" was a bit of a misnomer. Greenland , of course, is covered in ice, while Iceland is allegedly quite lush (although their hockey players are jerks). However, during World War II, suddenly everyone wanted in on Greenland's oft-forgotten frozen expanse. Not only did the location make for a nice little fueling spot for B-17s en route to either side of the Atlantic, it also could have served as Thanks to Coach Gordon Bombay and the Mighty Ducks (D2 to be specific), I already knew that "Greenland" was a bit of a misnomer. Greenland , of course, is covered in ice, while Iceland is allegedly quite lush (although their hockey players are jerks). However, during World War II, suddenly everyone wanted in on Greenland's oft-forgotten frozen expanse. Not only did the location make for a nice little fueling spot for B-17s en route to either side of the Atlantic, it also could have served as a missile launching pad for axis forces with their sights set stateside. For those of you who have read Lost in Shangri-la , you're probably aware that WWII plane crash survival stories are kind of Mitchell Zuckoff's thing (in addition to the use of extremely long subtitles). This time around there's a sort of meta story of how the story itself was researched and modern day obsession with what happened in the past (much like in David Gran's The Lost City of Z ). I was not a fan of the frame-tale for this one, but it wasn't poorly written, it just didn't add much to the thrill of the read. Also, there are a lot of names involved in this story. I had trouble keeping track of them, so I'm not going to really use them in this review, but Zuckoff's site details the cast of characters. If any of you have been lifeguards, EMTs or have taken basic first aid, then you'll know that a sure fire way to fail your practical is by not "surveying the scene" before attempting to help. The principle behind this is pretty basic- it's easier to rescue one person than it is two, two than three et cetera. Well, in the Coast Guard/military, that's not how things work- their m.o. is more no man left behind . So, when an American C-53 cargo plane went down with five survivors tapping out distress signals, everyone was all like "of course we'll go rescue them on that crazy-weathered iceberg." So, after a bit of scouting involving motor sleds and possibly some dogs, a group of brave Coast Guard men, set out in their B -17 PN9E to do some rescuing. Guess what? The B-17 crashed too. This added another nine to the count of men stranded in -40 degree weather with few supplies and low-visibility. If you're a fan of multi-national aeronautical disaster, then this is the book for you, because a Royal Air Force A-20 with a Royal Canadian Air Force crew, also had to make a forced landing on the same east coast ice cap. So, to sum it all up, we've got three planes down in Greenland in already horrible conditions and, not to get all Game of Thrones-y on you, but winter really was on its way. There's a lot of provisioning going on, near misses with crevasses and the thrill (for me at least) of dogs to the rescue . The words "duck hunt" immediately make me think of the annoyingly inaccurate "zapper" and smug, snickering, pixelated dog from the 1980s Nintendo game. The duck hunt in this story, however, deals with a bird of a different feather (I make no apologies for my puns). Thanks to Rip Riley, everyone should by now know that a seaplane looks like an airplane had a baby with a boat. 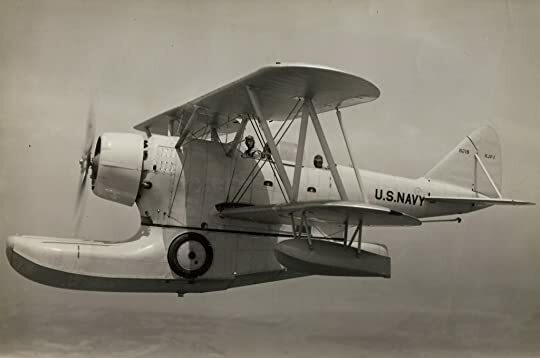 If we run with Rip's metaphor, then the Grumman Duck would be the phocomelia thalidomide scare poster child because it is one weird piece of aeronautical equipment. 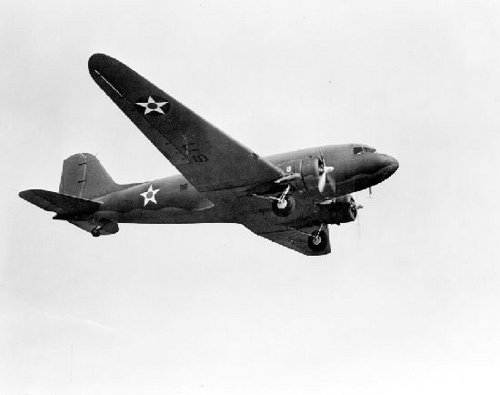 However, the duck and its operators proved their mettle when they were able to successfully land and rescue two of the men stranded in the B-17. The duck too, alas, was lost with its two heroic airmen to the arctic environs on the return trip, never to be seen again...unless, of course, the modern quest for lost heroes were to succeed. Frozen in Time: An Epic Story of Survival and a Modern Quest for Lost Heroes of World War II froze me to my seat. I seriously resented getting up for anything like eating, using the facilities, thirst...Finding out what happened to 9 plane crash victims on the snow and ice covered surfaces of Greenland riveted my attention like permafrost on the wing of a WWII B-17 bomber. The only thawing that took place occurred during the chapters about the locate/recovery expedition that Zuckoff partially fu Frozen in Time: An Epic Story of Survival and a Modern Quest for Lost Heroes of World War II froze me to my seat. I seriously resented getting up for anything like eating, using the facilities, thirst...Finding out what happened to 9 plane crash victims on the snow and ice covered surfaces of Greenland riveted my attention like permafrost on the wing of a WWII B-17 bomber. 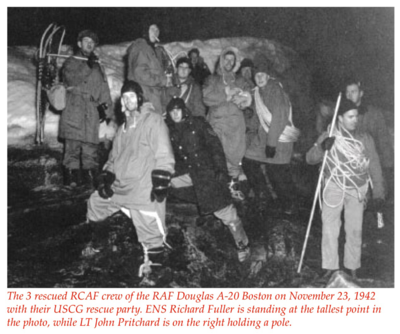 The only thawing that took place occurred during the chapters about the locate/recovery expedition that Zuckoff partially funded and took part in to recover the remains of 3 brave men and their Coast Guard Grumann Duck plane that crashed in an attempt to rescue the 9 plane crash survivors. However, not much melting took place in these sections as I found it amazing what is required to put together such a mission and how glacier-ly slow the U.S. Government moves. (Okay, that part wasn't surprising.) I found the unique personalities, stubborness and commitment of these men and women interesting and in some cases, inspirational. Who would like this book? Memoir readers, WWII history buffs, adventure aficionados, and anyone else that doesn't mind vicariously sitting on the edge of an ice crevice or walking over a deceptively thin ice bridge. This was such a good follow up book to my first disappointing book of the year (Persepolis rising) , after that I needed something different. This book is about a perilous ice rescue in Greenland, many things go wrong and the story takes it from there . If you like adventure, ice and exploration this book will satisfy you for sure . The Planes went down not in the sea, or the woods, and not somewhere that could easily be located by a rescue team or on a land that they could arrive safely on. The bleakest of environments the remotest of places, Greenland. Not just one crash, but many, lives lost in the rescue effort. Greenland will host men that represent bravery, determination and great willpower for survival, all in cause for the greater good of their fellow men, while a war raged with men an even greater war took hold, with The Planes went down not in the sea, or the woods, and not somewhere that could easily be located by a rescue team or on a land that they could arrive safely on. Greenland will host men that represent bravery, determination and great willpower for survival, all in cause for the greater good of their fellow men, while a war raged with men an even greater war took hold, with a lethal and power force that does not discriminate, nature. 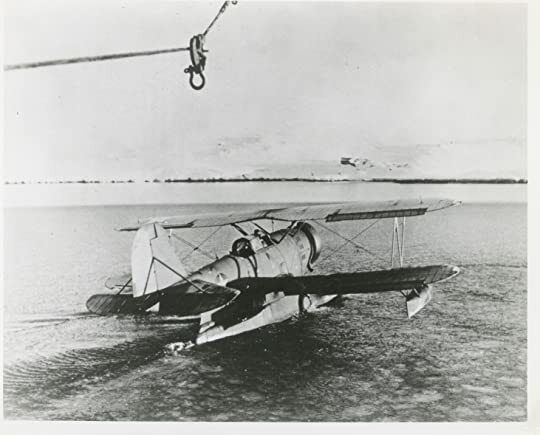 The rescue of the men in Greenland became a great challenge and proved to be a disastrous and terrible beauty, unforgiving to its denizens with the accumulating snow and snow storms, its unstable shifting icy surface and no exact crash position, time held the most paramount importance, every second counted and was a second closer to a grim end, in freezing conditions people would loose something if not their minds or starvation then possibly limbs. What happened to the Grumman Duck amphibious plane and the three men it carried? "This book tells two true stories, one from the past and one from the present. "I played a role in the Duck Hunt, and I appear in the book, but it isn't about me. It's about ordinary people thrust by fate or duty into extraordinary circumstances, one group in 1942 and another group seventy years later. Separated by time but connected by character, their bravery, endurance, and sacrifices reveal the power of humanity in inhumane conditions. I hope I've done them justice." Well you have Mitchell Zuckoff done a great justice in this wonderful story of truth, you have done research that truly goes beyond the norm for writing non-fiction and will be like ancient carving on a tree, for many a reader etched in the mind. A story, a rescue that would prove to present "a miracle on ice." sleeping bags, no heavy clothing, no Arctic survival gear. A few seconds outside would coat a man's face with frost. In minutes, blood would rush from his extremities to his core. Exposed skin would die. In the sky, the men on a B-17 were warriors. On the ground, they were frozen sardines in a busted-open can." "The war would wait, but freezing American airmen wouldn't." and still have room for a dessert of New Mexico, Arizona, Florida, Pennsylvania, and all of New England. It's three times the size of France, and it occupies more than twice the area of the planet's second-largest island, New Guinea. Yet Greenland is the world's loneliest place. With fifty-eight thousand residents, it has the lowest population density of any country or dependent territory. Only Antarctica, with no permanent residents, makes Greenland seem crowded. If Manhattan had the same population density as Greenland, its population would be two." "To fight cabin fever, they played word games. They named all the countries, rivers, capitals, islands, and every other geographical feature they could think of. They told and retold their life stories and talked about whatever came to mind. Still they ran out of things to say, so they spent long periods in silence. The isolation, the wind, the moving glacier beneath their feet, and the relentless cold preyed on their nerves. They seemed to take turns breaking down, wishing their ordeal were over, one way or another. Each time, the other two would comfort the crying man. When the cycle unraveled, all three sank into despair at the same time. They hatched a suicide pact." Really--I would have been petrified if my husband's job involved THIS type of research! I learned a part of EXCELLENT......4.5 stars!!!! I even now have a deeper appreciation for this (chilly) country ---LET ALONE the heroes (characters), which this book is written about! Mitchell Zuckoff just might be my personal 'go to' when I KNOW its time for me to read about areas of history that I've many holes in my own education. If history had been taught the way HE writes books ---I may have enjoyed my own history classes more. As an old far 'woman' I'm aware I am 'growing' into my own natural desire to fill in a few more of those holes. I've been enjoying Historical Fiction books for many years ---but would often shy away from NON-FICTION history books --- but after reading Zuckoff, Laura Hillenbrand, & Jon Krakauer also -- authors like these have helped WANT to read more (look up things I don't know, ask more questions, not shy away from being 'stupid'...and so on). So---I hope Zuckoff does NOT get hurt on any of these projects he takes on (dangerous little plane rides)....lol, because I will look forward to his next book also --and the book after that! This was truly an amazing story of courage, determination, and the willingness of some to risk their lives to save another. In 1943, a cargo plan on a regular flight slammed into a Greenland ice cap. In an attempt to mount a recuse, a B-17 became lost because of a phenomena called "flying in milk" and this plane crashed. All survived the crash, all nine of them miraculously Another plane called the Grumman duck mounted a rescue but it faced a storm and vanished. It also was a story told of the e This was truly an amazing story of courage, determination, and the willingness of some to risk their lives to save another. In 1943, a cargo plan on a regular flight slammed into a Greenland ice cap. In an attempt to mount a recuse, a B-17 became lost because of a phenomena called "flying in milk" and this plane crashed. All survived the crash, all nine of them miraculously Another plane called the Grumman duck mounted a rescue but it faced a storm and vanished. It also was a story told of the efforts of a group from the Coast Guard and the North South Pole, led by a man named Lou Sapienza, to find the place and try to solve the mystery of why the Grumman duck went down. The expedition to do so occurred in 2012. By that time the Duck was buried under twenty feet of ice. How they eventually find the Duck forms an integral part of the story. Mitchell Zuckoff’s Frozen in Time: An Epic Story of Survival and a Modern Quest for Lost Heroes of World War II is the account of a series of mind-boggling tragedies that occurred in Greenland in the 1940s. Beginning in November 1942, a U.S. cargo plane slams into a Greenland ice cap. Four days later, a B-17 searching for the plane becomes lost in a blinding storm and also crashes. A second rescue attempt is launched, and that plane flies into a severe storm and vanishes. Men and dog sled teams Mitchell Zuckoff’s Frozen in Time: An Epic Story of Survival and a Modern Quest for Lost Heroes of World War II is the account of a series of mind-boggling tragedies that occurred in Greenland in the 1940s. Beginning in November 1942, a U.S. cargo plane slams into a Greenland ice cap. Four days later, a B-17 searching for the plane becomes lost in a blinding storm and also crashes. A second rescue attempt is launched, and that plane flies into a severe storm and vanishes. Men and dog sled teams also put themselves at peril attempting to reach the crash site. Zuckoff immerses himself in the researching of these events and recounts the heroic attempts that were made to bring men home from the ice cap. Some men from the original cargo plane survived. Some didn’t. Some rescuers survived. Some didn’t. Many of the men suffered terribly from the severe cold and deprivation, while others fared only slightly better. Zuckoff’s book flips between the 1940s and today as he also writes about a modern-day, daring attempt to locate, and bring home, the bodies of three of the rescuers. 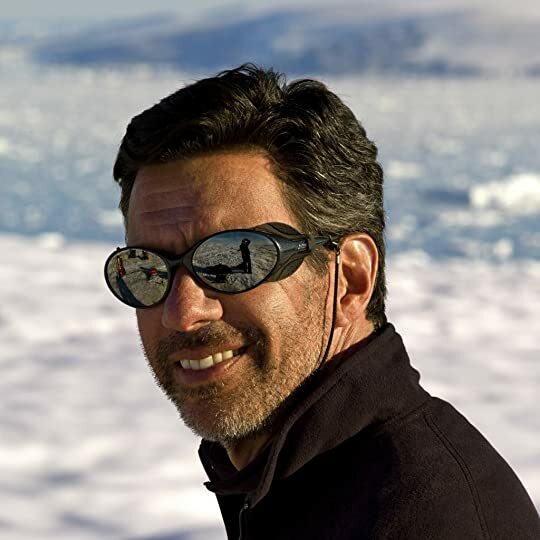 It is especially interesting to read of their zany activities preparing for that excursion, with Zuckoff actually participating in the search and recovery efforts in Greenland. We soon see that the party is at peril as they try to find the remains of the plane and the three bodies. All of the modern equipment and technology at the party’s fingertips can’t stop the storm that is bearing down on them – threatening to halt their efforts and keep them in Greenland forever. Before I sat down to write my review of Frozen in Time, I went back to read the review I did of Lost in Shangri-La, the last book I read by Mitchell Zuckoff. Boy, did I like that book. I'm not sure I've given such a glowing review to another nonfiction book since I've started blogging. I droned on and on about how masterfully the author was able to not only bring the events alive, but to humanize the the men and women involved, making them feel three dimensional in ways most authors can't do wit Before I sat down to write my review of Frozen in Time, I went back to read the review I did of Lost in Shangri-La, the last book I read by Mitchell Zuckoff. Boy, did I like that book. I'm not sure I've given such a glowing review to another nonfiction book since I've started blogging. I droned on and on about how masterfully the author was able to not only bring the events alive, but to humanize the the men and women involved, making them feel three dimensional in ways most authors can't do with historical figures. I had paragraph after paragraph lauding the author's narrative voice, his attention to detail, and his ability to make history as easy to read as fiction. It would be far easier for me to cut/paste my review of Lost in Shangri-La, changes a few names around, and have the review over and done with. Since that's cheating, I won't do that. What I do want to say is how much I appreciate books like this. There is so much of our history, heroic stories that seem to be forgotten in a rather short amount of time. They may capture the news of day, or even a month or two, but new events slowly force them back in time, into a miasma of obscurity that tends to swallow them whole. Rarely, and only after an untold amount of dedication brought to the story, do the men and women history forgot, get a chance to be remembered again. Zuckoff is brilliant at being able to pluck a instance of history and bring it back to life in all it's glory. He doesn't just tell the story, he makes his readers live the story along side those he is bringing back to life within the pages of his books. Parts of me, felt every moment these men spent on the ice. I put myself in their shoes, and I honestly don't know that I'm man enough to fill them. What they went through, the physical and mental anguish brought forth by the circumstance they found themselves in could easily break most of the men I know. I gasped out loud as men who survived a plane crash onto a desolate Arctic wasteland, who survived for untold weeks upon the ice, succumbed to the dangers all around them. Whether they were plunged into the bottomless depths of an icy crevasse, or lost for over 70 years entombed in ice after a plane coming to rescue them, is lost to a storm, I can only imagine the anguish they most of felt, right before they slipped away. It's a horror I'll never feel, but it's a horror I can now sympathize with. The way he weaves the three crash stories together, two of which are a direct result of the first, is seamless. There is a rhythm to the events and to his narrative that carries the reader along, never allowing them to get bogged down in confusion or apathy for what they are reading. When the narrative switches to the present, where he is not only finding himself personally, but financially as well, invested in the search for the doomed rescue plane, and it's three passengers, it fits in with the rest of the story. So often, there is a jarring sense of dislocation when a historical narrative jumps time periods, Zuckoff pulls if off perfectly. Have you ever read a thriller novel where extraordinary and harrowing things happen to the characters but somehow they get through it against all odds? Well, that's what it was like reading Frozen in Time, except that it's not fiction, it's the true-life thrilling story of how a handful of WWII officers crashed into the barren and frozen Ice Cap of Greenland and survived for months. The story also alternates with the present story of a quest to find the lost Grumman Duck plane and the frozen rem Have you ever read a thriller novel where extraordinary and harrowing things happen to the characters but somehow they get through it against all odds? 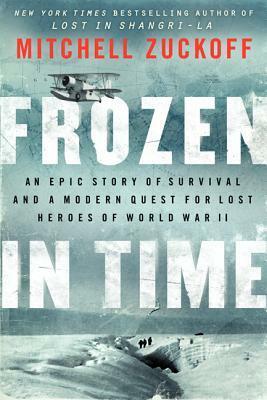 Well, that's what it was like reading Frozen in Time, except that it's not fiction, it's the true-life thrilling story of how a handful of WWII officers crashed into the barren and frozen Ice Cap of Greenland and survived for months. The story also alternates with the present story of a quest to find the lost Grumman Duck plane and the frozen remains of three officers. Just as he did with Lost in Shangri-La, Zuckoff once again blew me away with his writing, bringing to life through narrative prose these valiant men, their adventures, their survival stories, and their families. By the end of the book, I felt like I knew these people personally. This is the gift of Zuckoff's writing. He allows the reader to truly get to know the people he writes about—not just facts, but their hopes and dreams—making the reading experience a touching one. I didn't know a thing about Greenland, but Zuckoff makes sure the reader understands what kind of land it is just so one could appreciate all the obstacles the survivors encountered and how miraculous their survival really was. There were several times I choked up with tears as I read about these men's self-sacrificing acts and their mental anguish. Zuckoff makes it clear in his note to the reader that he takes no liberties with facts, dialogue, characters, details or chronology. This nonfiction work is based on his thorough research in the form of declassified documents, maps, photographs, interviews and previously unknown journals. He also joined the expedition team that travelled to the remote glacier in Greenland in search of the lost Grumman Duck plane. He tells us firsthand all about it. I am counting this book as a favorite of 2013. I am a big fan of Zuckoff and will read anything by him, knowing that I am in for a well-written, exciting, and grand story. What an exhilarating epic this is! Of rescue attempts that boomerang and of more rescue attempts to rescue the would-be rescuers! And it is so sad of the loss of life of these altruistic individuals (and they were truly individualistic personalities) who gave the ultimate sacrifice to help those whom they had never met. It really does give one a wonderful sense of humanity. It all takes place in Greenland – a foreboding and harsh environment – where literally every step is laden with danger. Gree What an exhilarating epic this is! Of rescue attempts that boomerang and of more rescue attempts to rescue the would-be rescuers! And it is so sad of the loss of life of these altruistic individuals (and they were truly individualistic personalities) who gave the ultimate sacrifice to help those whom they had never met. It really does give one a wonderful sense of humanity. It all takes place in Greenland – a foreboding and harsh environment – where literally every step is laden with danger. Greenland is covered with glaciers that have massive crevasses that are sometimes camouflaged by a thin layer of ice. Two of the rescuers disappeared forever into a bottomless pit. As this story well exemplifies nature in Greenland is not a trivial outdoor experience – it is a destroyer that is relentless day in and day out. The narrative alternates between the events of World War II when these planes crashed and the present day attempts to re-locate the fallen planes and hopefully bring back the bodies. Despite the complexities of the various rescue attempts it is all logically explained by the author. And to answer the question as to why the U.S. went to Greenland during the Second World War - they wanted to get there before the Germans did! 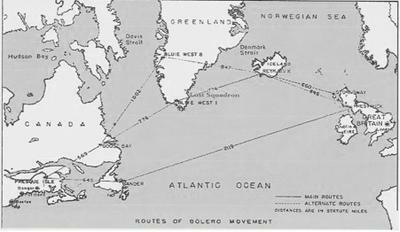 After Germany conquered Denmark (Greenland belongs to Denmark) – and then Holland, Belgium and France – both the U.S. and Britain felt it imperative to establish bases in Greenland to combat the German U-boat menace. This book is truly a thriller and page turner – with wonderful doses of humanity! Another gripping tale of inspiring fortitude and courage from the author of Lost in Shangri-La, one of my all time favorite books. This true life saga revolves around the efforts to rescue WWII American military personnel stranded in the unforgiving terrain of Greenland. That story alternates with the present day efforts to retrieve the remains of the soldiers who didn't make it. I'm the last person in the world to be enthralled by technical descriptions of airplanes, a 4.5 stars rounded up to 5. I'm the last person in the world to be enthralled by technical descriptions of airplanes, and computers, and putting together the gear needed for a trip to arctic cold. But Zuckoff writes in a way that made me willing to follow him through such details because the payoff was his accompanying portraits of the people involved in this story. They leap off the page and you experience the highs and lows of their emotions as they experience setbacks, despair, then get back up and keep trying. So good. So excellent so great! This is why I love reading non fiction. It does not happen often. That you start a nonfiction book about a subject you do not know much about. In my case Greenland and what happened there during WW2 and that the author makes you really understand how it was and makes you interested in the subject and you wanting to learn more. For me that is why I love to read non fiction and Mitchell Zukoff managed all of the above. Now I also love survival stories and if you like to So good. So excellent so great! Received as an ARC via my employer Barnes & Noble. Wowee! What an adventure story, and it's all true. This book is so real in its description of the weather on Greenland that it would probably be perfect to read on a 95 degree day in July for cooling off. But the dangers are frightening!!!! It's the story of crashed aircraft during WWII, and the failed and successful missions to rescue the crews. And the modern story of a mission to recover one of the planes and the buried crew under 200' of Received as an ARC via my employer Barnes & Noble. Wowee! What an adventure story, and it's all true. This book is so real in its description of the weather on Greenland that it would probably be perfect to read on a 95 degree day in July for cooling off. But the dangers are frightening!!!! It's the story of crashed aircraft during WWII, and the failed and successful missions to rescue the crews. And the modern story of a mission to recover one of the planes and the buried crew under 200' of snow and ice. I will never look at snow, at ice, the same way again. Being the daughter of a pilot, there was a lot of this that really hooked me in perhaps a slightly different way than others may have felt. While my father was a pilot for commercial airlines for most of his life, he started out at a very young age flying local routes - mostly mail routes, and later on trained the Air Force pilots when the pilots at Glenn L. Martin were "requested" to do so. Stories, I've heard plenty and pictures to go with I will never look at snow, at ice, the same way again. Being the daughter of a pilot, there was a lot of this that really hooked me in perhaps a slightly different way than others may have felt. While my father was a pilot for commercial airlines for most of his life, he started out at a very young age flying local routes - mostly mail routes, and later on trained the Air Force pilots when the pilots at Glenn L. Martin were "requested" to do so. Stories, I've heard plenty and pictures to go with them. There's very few places he never flew, but Greenland is one of those places that, as far as I know, he never flew, or never mentioned he flew over, but he had a few close calls in his career with flight. As I was reading this, I was thinking of my Dad, and how much more appreciation he would have for this story of their survival, and how much appreciation he would have for the modern day quest to find these "lost heroes." The men involved in this story add another level of appreciation to the idea of a survival story. It's one thing to survive a crash, it's another to survive the conditions after the crash. Not only is this an epic story of their survival, but Zuckoff does a more than admirable job allowing us to get to know them before and after the crash, which adds immeasurably to the story. There is also the modern quest for finding these men, which adds another era to the term heroes. There's a little bit of MacGyver'ing necessary to complete some of these tasks, and and lot more blood, sweat and tears to get to that point, but I was never disappointed. The island of Greenland proves that it does not always have to be hot in hell. It is an unforgiving land with a miniscule population of Inuit Eskimos and not much else except ice and snow. Greenland was used as a stopping off point for cargo planes on their way to England while the US was still neutral in WWII and also during the war. The bases were managed by the US Coast Guard and much of their work was rescue as aircraft accidents were not uncommon. In 1942 a cargo plane went down and a B-17 The island of Greenland proves that it does not always have to be hot in hell. It is an unforgiving land with a miniscule population of Inuit Eskimos and not much else except ice and snow. 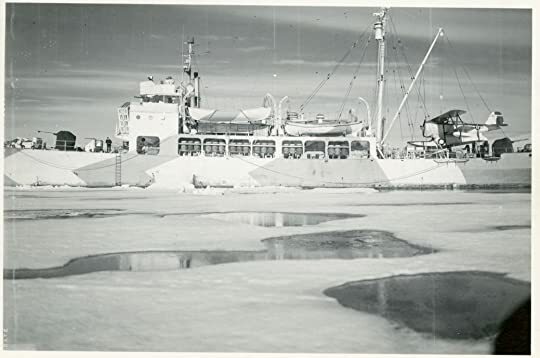 Greenland was used as a stopping off point for cargo planes on their way to England while the US was still neutral in WWII and also during the war. The bases were managed by the US Coast Guard and much of their work was rescue as aircraft accidents were not uncommon. In 1942 a cargo plane went down and a B-17 goes out to rescue. Unfortunately it also crashes and three weeks later, the Coast Guard hears faint signals from the plane and decide to send out another rescue mission in a Grumman Duck which also disappears. These tragedies were not well known in military history until in 2012, when a group of dedicated men, including the author went to an isolated glacier in Greenland to find the planes and bring home the men entrapped in the ice for over 60 years. If there was a higher rating than 5 Stars, this would be a 6. The author did a terrific job of transitioning between 1942 and 2012. Between the crashes on the Greenland Icecap and the search for remains, from the life of survivors waiting for rescue, the rescue after months & the raising of funds to find and bring the Coast Guard plane & the Coasty bodies home in 2012. The awful Greenland weather has prevented the later. I rated the book high for another reason, Bernt Balchen's part in th If there was a higher rating than 5 Stars, this would be a 6. The author did a terrific job of transitioning between 1942 and 2012. Between the crashes on the Greenland Icecap and the search for remains, from the life of survivors waiting for rescue, the rescue after months & the raising of funds to find and bring the Coast Guard plane & the Coasty bodies home in 2012. The awful Greenland weather has prevented the later. After reading Zuckoff's book, 13 Hours, I moved this book up in my to-read list and I am glad I did. The book moves along fast and I like the amount of background Zuckoff gives. 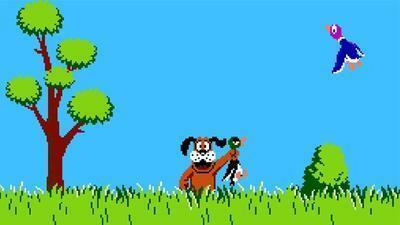 The modern day Duck Hunt parts of the book also puts makes the book more interesting. This book is what I love about reading, and that is bringing history back to life and while also honouring brave men and women. Another hit by Zuckoff!! Si tratta di un reportage su una tragedia realmente accaduta durante la 2^ guerra mondiale. La narrazione si divide fra il 1942 e il 2012: il primo l'anno della tragedia, il secondo l'anno in cui fu organizzata una spedizione sui luoghi del disastro aereo. Un buon reportage, forse un po' troppo didascalico, non coinvolgente come altri che ho avuto modo di leggere (uno per tutti Aria sottile). Il mio voto: 3 stelle. Just ordered recently from America and I have just finished reading this incredible book. It is called Frozen In Time by Mitchell Zuckoff. I can not recommend this book enough, it is a biography and really autobiography as the author is very much involved in the 2012 part of the book, but the main story is in 1942/1943. A story that touches your heart with the bravery of so many people and how the body and mind fights for life. The story is a true story, of one plane crashing in the freezing wilderness of Greenland with five passengers and the second plane sent to help to trace this plane and five passengers. The second plane has nine passengers and this also is lost in the wilderness. So a third plane from a coast guard ship is sent to rescue, and this also is lost on a second trip. How so many helped on different rescue missions. Please read, so many heroes. 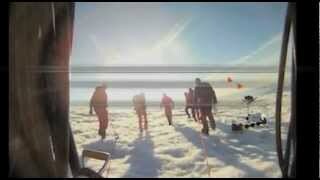 Also the story in 2012 of a returning to Greenland to search and recover the planes. Who knew there were so many—and so deadly—airplane crashes in Greenland during a one month period in the early 1940s? Five, at least, I think; if my count is close to accurate. So many crashes, with so many people involved, it got awfully confusing to follow the who, when and where of this audio book. Compound this confusion with a whole new (humongous) cast of characters for a recovery attempt (of one of the five planes from the original story) some seven INTERESTING, INFORMATIVE AND CONFUSING. Who knew there were so many—and so deadly—airplane crashes in Greenland during a one month period in the early 1940s? Five, at least, I think; if my count is close to accurate. So many crashes, with so many people involved, it got awfully confusing to follow the who, when and where of this audio book. Compound this confusion with a whole new (humongous) cast of characters for a recovery attempt (of one of the five planes from the original story) some seventy years later, and some of this story might well have been written/read in Norwegian or Inuit for all I could follow. Maybe they 'should have' recruited Jon Krakauer to tell this one. 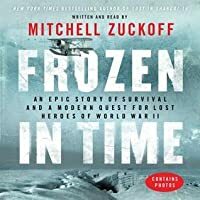 Recommendation: FROZEN IN TIME: An Epic Story of Survival and a Modern Quest for Lost Heroes of World War II, by Mitchell Zuckoff is an interesting adventure/rescue/recovery tale—but not as readable as Zuckoff's, Lost in Shangri-La. Excellent book that had me waiting with bated breath and a hopeful heart to learn whether the men would be rescued, or whether the expedition team would be successful in recovering the remains of those heroes who died trying. I love the power of narrative nonfiction and it's ability to breathe life into a story and its characters, and Zuckoff has mastered the skill. The survival story is compelling-a harrowing account of soldiers stranded in Greenland's brutal arctic weather. The modern quest was less engaging, but became more interesting in the time press to make a discovery. There are a lot of people to keep track of, so the index comes in handy along with the glossary of names. This WWII non-fiction book couldn’t have been better if the story was made up. Amazing writing. Very well researched. As soon as I finished it, I was on the internet checking for updates to the story. Loved it. Highly recommended. First there's the name, which as most schoolchildren know should be Iceland, but that was already taken. Almost nothing green grows in Greenland, where more than eighty percent of the land is buried under deep ice. Deep, as in, up to ten thousand feet, or two solid miles. If all of Greenland's ice melted - a worst-case scenario of climate change - the world's oceans would rise by twenty feet or more. Greenland's strangeness is compounded by it's great politically incons "Greenland makes no sense. Greenland's strangeness is compounded by it's great politically inconsequential size; its almost complete emptiness and it unconscionable weather. More than sixteen hundred miles from north to south, and eight hundred miles at its widest point, Greenland could swallow Texas and California and still have room for a dessert of New Mexico, Arizona, Florida, Pennsylvania, and all of New England. It's three times the size of France, and it occupies more than twice the area of the planet's second largest island, New Guinea. Even more than its size, Greenland's most defining feature is its climate. Temperatures vary along a spectrum of discomfort, ranging from bone-rattling to instant frostbite. In many places, temperatures regularly reach the only place on the thermometer where Celsius and Fahrenheit agree: 40 degrees below zero. For much of the year the north of Greenland is ringed by solid pack ice, and the waters to the south are beset by the storis, a twenty-mile belt of floating icebergs. In the fall and winter, devastating blizzards known as piteraq storms race more than a hundred miles across the broken landscape. The wind blows glacial dust that can scour glass or blind eyes left unprotected." This is the setting for a rescue mission of epic portions that will span over 70 years and is still ongoing. 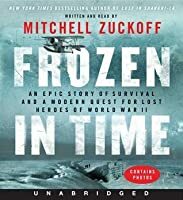 In the book Frozen in Time by author Mitchell Zuckoff, he chronicles the first plane crash in November of 1942 of a C-53 cargo plan that slammed into the Greenland ice cap. Four days later, a B-17 assigned to the search and rescue mission became lost in a blinding storm and also crashed. 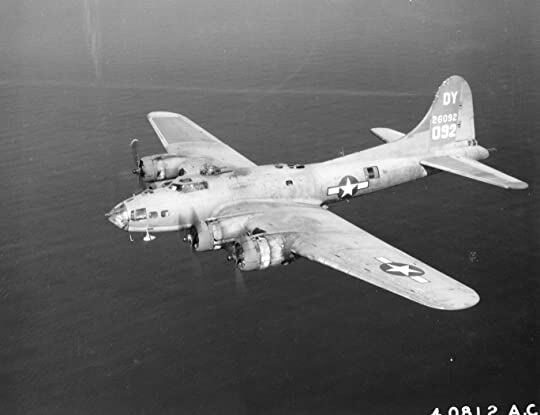 Miraculously all nine men on the B-17 survived. 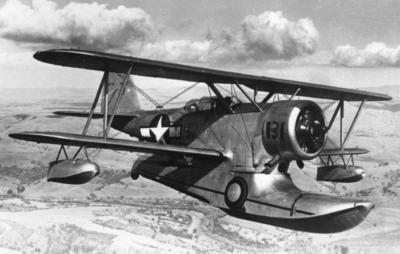 With the weather worsening, the U.S. Military launched a daring rescue mission, sending a Grumman Duck amphibious plane to find the men. 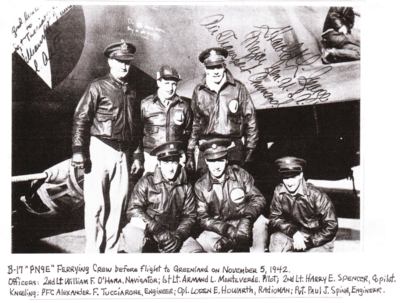 After picking up one member of the B-17 crew, the Duck flew into a severe storm, and the plane and the three men aboard vanished. The author was part of the current research and exposition in 2012 to travel to Greenland in search of the missing planes and to recover the bodies of these military heroes and attempt to bring their bodies back. He takes the reader back to 1942 to tell exactly what happened based on digging through newspaper archives for hidden treasures, collecting declassified documents, maps, photographs, interviews, and previously unknown journals seeking information to put this book together as well as capturing the ongoing search for the remains of these planes and the men aboard. It is written as a narrative, but this is a work of nonfiction. Because the story moves between past and present, date markers such as "November 1942" and"October 2011" signal which tale is being told. Mitchell Zuckoff is a professor of journalism at Boston University. He is the author of Lost in Shangri-La: A True Story of Survival, Adventure and the Most Incredible Rescue Mission of World War II. His previous books are: Robert Altman: The Oral Biography, one of Amazon.com's "Best Books of 2009"; Ponzi's Scheme: The True Story of a Financial Legend, a New York Times Editors' Choice book; and Ch Mitchell Zuckoff is a professor of journalism at Boston University. He is the author of Lost in Shangri-La: A True Story of Survival, Adventure and the Most Incredible Rescue Mission of World War II. His previous books are: Robert Altman: The Oral Biography, one of Amazon.com's "Best Books of 2009"; Ponzi's Scheme: The True Story of a Financial Legend, a New York Times Editors' Choice book; and Choosing Naia: A Family's Journey, which received the Christopher Award and was named a Massachusetts Honor Book. He is co-author of Judgment Ridge: The True Story Behind the Dartmouth Murders, which was a finalist for the Edgar Award.